Tiptoeing Along A Balance Beam: Writing And Illustrating A Children's Book : NPR Ed Gabrielle Emanuel, a first-time author, sets out to write a culturally appropriate book for children in Mali — and learns a lot about how words and pictures go together to tell a story. She gazed at the picture and then asked, "What's an ugly stepsister?" The concept just didn't translate. 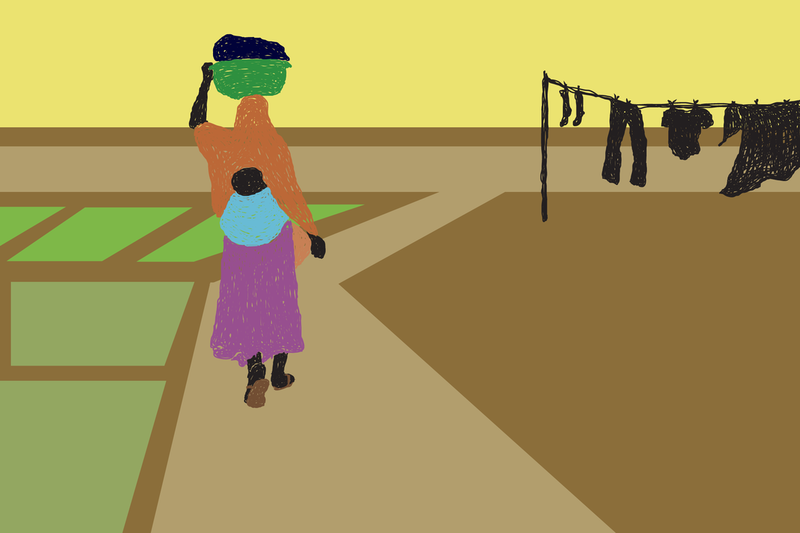 In Mali, polygamy is commonplace but divorce is not. Robert McCloskey's Blueberries for Sal caused trouble too. The kids seemed unsure whether blueberries were real or the stuff of fantasy. Same with the bear Sal stumbles upon. And then there was the whole question of Madeline's clothes. Why is she showing her knees? Everyone in this West African country knows knees are a private body part. We fixed the illustrations. But, of course, these children's books weren't written with any of Mali's millions of children in mind. When I moved to Mali in 2010 to work for an international health organization, I knew two things. First, from living abroad before, I knew kids would be a key ally. Nonchalant about the language barrier, the neighborhood gaggle of kids could be an expert guide as I learned my way around a new country. Second, I knew the literacy rate in Mali. It's one of the worst in the world, with estimates suggesting only a third of the adult population can read and write. Hence, I packed a suitcase with children's books. But there was something I didn't anticipate: These children's books would expose cultural barriers, and the stories would feel utterly foreign to the kids. And so, I decided they needed a new storybook, one that felt familiar. But I had no idea where to start. All the words I jotted down seemed trite. The storylines were either stale universal lessons or local legends the kids already knew by heart. While I couldn't find the words, I could find the images. They were all around me. The home wouldn't have staircases or plush carpets. Instead, there'd be a family compound with colorful laundry bopping in the breeze. There'd be no supermarkets, but plenty of outdoor, sundrenched markets. Having never taken an art class, I pulled out my camera. And soon I was staying late in the office to take advantage of the relatively consistent electricity. I'd sit there tracing photographs I'd uploaded to my computer. With little squiggles of the mouse and liberal use of the 'flood-fill' function, I tried to emulate the local artistic style. Bold colors. Strong, dark figures. As the air conditioner panted away, I'd periodically take a break from tracing to fiddle with words. I started by just describing the scene. The next day, I might jot notes about the characters. Eventually, cautiously, I approached the intangibles, trying to capture the characters' thoughts and hone the tone. And so, the pictures begot the words and turned themselves into a story. 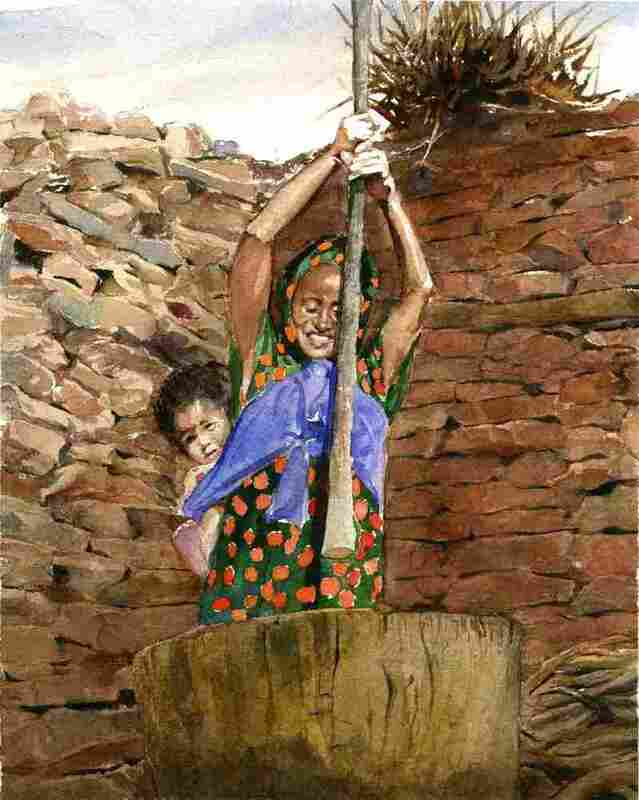 It became a portrait of daily life in a village in Mali, told from the perspective of a little girl being carried on her mother's back. There was no grand life lesson for the local kids, except that the written word and the printed illustrations could reflect their world. About a year later and half a world away, I sat in a dimly lit pub down a narrow street in Philadelphia. E.B. Lewis sat across from me. Lewis has won numerous awards for his children's book illustrations, including a Caldecott Medal. Almost as soon as I scooted into the booth, he told me there was one theme that connected all the books he illustrates, "and it's emotion." The story I'd drafted after-hours in Mali was in the process of being flipped. It would soon serve American children, not Malian ones. It would introduce kids to an entirely different part of the world, instead of depicting a place they immediately recognize. For this inversion to be successful, the publisher told me we needed new illustrations, ones that felt familiar to American children. Enter E.B. Lewis. His arrival promptly ripped apart my long-held perception that a book's illustrations and words were nearly inseparable. I'd always imagined they were born together or, at least, in close collaboration. With a chuckle, Lewis set me straight: "I don't think about the author at all. They had their opportunity to play in their sandbox, and now this is my turn to play." We only met because of a coup d'etat. Adamant that our book accurately reflect the country, Lewis was ready to jump on a plane to Mali, but emboldened rebels and mutinying soldiers scuttled that plan. So his backup strategy included getting a Malian model as well as poring over the photographs I'd taken and traced back in Mali. We spread the photographs out on the pub table. He refused to see the images they inspired me to create. Instead, he zeroed in on the textile patterns, the color of the soil, the building materials. And then he was off. I didn't hear from Lewis again until the book was just about to be published. It all felt somewhat mysterious, so I got in touch to find out what the illustration process entailed for him. Immediately, I noticed that he spoke as an author as much as an artist. He talked about "writing" the images. He said he spends time thinking about the punctuation in his paintings. A comma is an element that gives the child's eyes a little visual break. An exclamation mark helps indicate the drama of the scene. Lewis talked about this in a matter-of-fact manner: "This visual language is actually a language, and I don't look at it as illustration." It made me realize that a picture book is a story told in two languages: one that kids are learning, and the other that they're fluent in. In a droning voice, Lewis told me a big problem is "monotone" illustrations. Then he snapped into action and started listing his strategies to ensure adequate intonation. First, color contrast. "Look at this one where she's pounding millet," he said, pulling out our book. The page is full of greens and oranges. "Then you turn the page and you go to these blues. So blue and orange are a direct contrast." This is almost like varying the inflection in your voice as you read aloud. Second, his characters provide a sense of movement. If he's not doing a dramatic perspective — he pointed to a shot of just the feet or one from above the head — then "you always see them going left to right, so they are moving into the next page." In addition to learning what Lewis is doing, I also learned what he wasn't not doing. He was not repeating the text. "That's already told. Why would I tell it again?" He flips to the last page of our story. The illustration is a panoramic view of a village at dusk. Everything feels quiet. Lewis admitted, "The text doesn't suggest any of that." He's right. The words are about the child growing too big to ride on her mother's back, yet retaining her bond with her mom. "I illuminated it — that peace, that place," he said. "So it goes full circle. As the book starts in the sunshine, you know that the day's light is going to come again." Also, "you can never compete with a child's imagination," Lewis said. "Their imagination is going to be far greater than anything you can ever paint." This often means not depicting the most fundamental parts of a story. As I listened to Lewis, I started to realize that we were both tiptoeing along a balance beam, trying to figure out just how much to give kids in order to inspire their own confidence. Confidence to trust their imagination. Confidence to see the written word as theirs to own. But I didn't know whether we'd succeeded. So, I packed a box full of our newly minted books and took it to the post office. As I paid for the postage to Mali, I felt a sense of anticipation. The neighborhood gaggle would be the ultimate judge of this book. 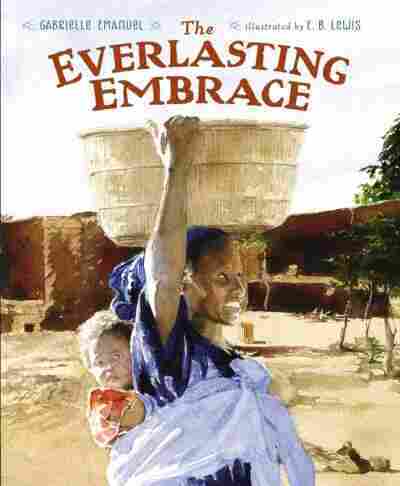 Gabrielle Emanuel, a former NPR Kroc fellow, is the author of The Everlasting Embrace.